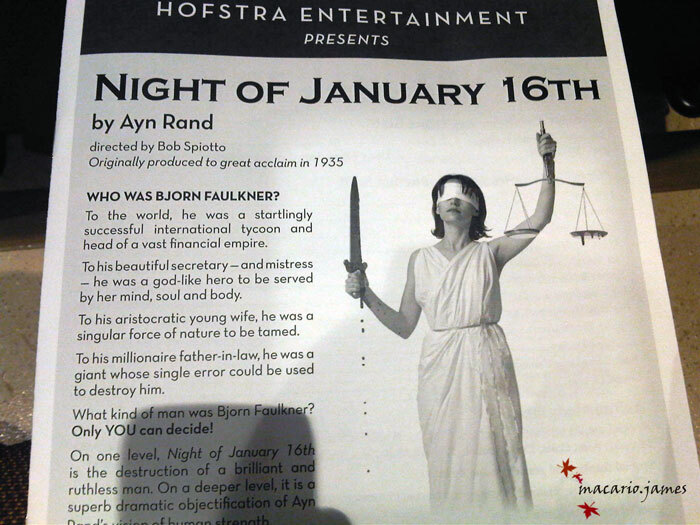 Last night i caught a showing of a play performed on campus: Ayn Rand’s The Night of January 16th. I loved the line, “I’m an atheist—there’s no use for that [the Bible]” when Miss Karen Andre is sworn in to tell the “whole truth…” so help her God. The above was the start of a 365 Days post (day 011) from a little over a year ago. I’m really not sure how i got so sidetracked that i didn’t continue writing it. Hmm, maybe it had to do with my then recent breakup, not ready to truly talk about my love for atheism and antitheists, the secular passion within toiling and bubbling. It might be in my journal/diary. Not looking to go back, though; not now at least. Anyway, i’ve been doing a “spring cleaning” of sorts on all things in my life: from digital missives and notes and blog posts, to my recent (not really since it was in October!) move, which i still have boxes of books and bags of clothes and a mixture of both still strewn around and adorning walls. I’ve been in a mental fog and muddling through a physical swamp of crap from my past, years and years ago, to more recent trinkets gathered—so completing or getting rid of hangovers is cathartic right now. Much needed. That block quote way at the beginning of this post is significant at present as it was last January. It’s a parallel to people in my life, their ideas and motivations, as well as my recent Twitter conversations and Tweets, ruffling the feathers of religious zealots, brandishing my own (and others’) refutation of religious myths as truth (as gospel), exposing their fictitious nature. Ayn Rand’s Atlas Shrugged did something to me. I was about 20 or 21 when i read it (i need to re-read it soon). I’ve since read her seminal offering to individuality: Anthem, thinking about getting the protagonist’s “name” (Equality 7-2521) tattooed. Yeah, it’s that real. I’ve Wikipedia’d her. I’ve shared quotes & other tidbits from interviews on Tumblr and Twitter. She was an outspoken and unabashed advocate for individualism, enriching literature, and dispelling myths of women’s inferiority in academics (and maybe socially? not too sure). She continues to live on, is the point i’m concerned with—but, of course! it all revolves around legacies for me. Darnit! My wifi went down in the middle of writing this, and i’ve yet to catch up to my train of thought—it has probably been derailed miles ahead. Hmmph. So: read Ayn Rand, a paragon of personal strength and believer in individual’s having power, too. It’s the best i can offer at the moment. I’ll return later to this.